Indigenous groups are questioning the political will to implement a peace accord signed 13 years ago to resolve land disputes in the Chittagong Hill Tracts (CHT) of southeastern Bangladesh. Over the last few decades, the Jumma, a group of 11 indigenous communities in CHT, have lost land to Bengali settlers brought in by the government to this heavily militarised, restricted zone. In 1977, the Shanti Bahini, the military wing of Parbatya Chattagram Jana Sanghati Samiti (PCJSS), a pro-indigenous political party, began a 20-year armed struggle in part to counter the settlement of Bengalis in CHT and to gain self-autonomy, a conflict which ended with the signing of the 1997 CHT Accord. “The politicians have committed on paper, but up till now there has been a lack of initiative in implementing the accord,” said Santu Larma, president of PCJSS, at a conference in Dhaka on 29 November marking the anniversary of the accord. The 1997 Accord, which met fierce opposition from some indigenous and Bengali groups, acknowledged CHT as a “tribal inhabited” region, and called for recognition of the CHT Accord within the constitution of Bangladesh, the immediate withdrawal of the military, and an end to the settlement of Bengalis. But little has been done by the government to honour the agreement, activists say. “The peace accord stipulates land should be returned to the owners once their ownership rights can be ascertained. However, many Jummas [indigenous peoples] share communal land, do not have deeds, or their paperwork was lost when the land records office was burned down in Khagrachari,” Raja Devasish Roy, king of the Chakma Circle - representing the largest ethnic group in the Jumma - and adviser to the Ministry of CHT Affairs. From 1979-1985 the government of Bangladesh relocated 400,000 destitute Bengalis to the CHT with promises of land and food. The programme was a strategy to stop the indigenous insurgency. “They [the government] promised us land and rice if we moved to the CHT,” said Hossain Aktar, who arrived in Rangamati in the early 80s. “We've built our lives here and now the indigenous want us to take everything and leave. But we have nowhere to go,” he said. Though resettlement has not occurred officially since 1981, Bengalis continue to move to the area, NGOs say. According to the UN, the number of indigenous people living in the CHT as a percentage of the population has fallen from more than 91 percent reported in 1951 to about 50 percent in the most recent 1991 census. The total population of the CHT is currently estimated to be around 1.3 million. In 2001, the Land Commission Act was passed to guide the government in giving land back to the rightful owners, but was opposed by the indigenous leaders because the act favoured the Bengalis and did not fully comply with the 1997 peace accord. Later, a 2008 government manifesto promised to fully implement the accord; however, only 35 out of 400 military camps have been withdrawn, the pro-indigenous PCJSS's Larma said. “They [Bengali settlers] forced me off my land,” said Sanjay Chakma, a member of the Chakma community which numbers in the thousands. Many of the Bengali settlers who paid tax on the land they occupied have produced receipts as a kind of “proof of purchase”, and so have claimed ownership through the only documentation accepted by the central authorities. “I didn't have the paperwork to prove the land belonged to me,” said Sanjay, father-of-three, who now works as a day labourer earning less than US$2 a day in Rangamati. He is one of thousands who have lost their land over the years. 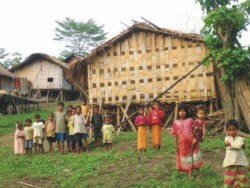 Tensions over land can quickly flare up into small-scale conflict as was the case in February 2010 when almost 500 indigenous homes were burned to the ground by Bengali settlers in Rangamati District, allegedly under the noses of the police and the army. “Peace in the CHT is largely dependent on resolution of the land issue,” Devasish Roy said. The main push for the indigenous is now to pressure the government into committing to a timeframe for implementing the Peace Accord. “It will take time to implement,” Dipankar Talukdar, the state minister for CHT Affairs, said at an International Labour Organization (ILO) conference in November. “How many decades more will it take?” asked Larma, who signed the peace deal on behalf of the Jumma in 1997. Source: IRIN, humanitarian news and analysis service of the UN Office for the Coordination of Humanitarian Affairs.